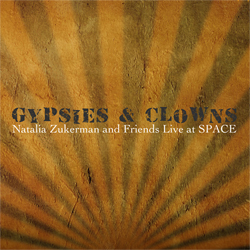 Natalia Zukerman has always combined the pop songcraft of Shawn Colvin, the rootsy, organic yearning of Lucinda Williams, and the fierce, funky determination of Ani DiFranco, and given these elements a unique twist with her unmistakably personal and intimate voice. Never has all this been heard to better effect than on her new, two-disc live recording, Gypsies & Clowns, on which she’s joined by nearly a dozen friends and longtime collaborators (including Edie Carey, Susan Werner, Willy Porter, Garrison Starr, Erin McKeown, Trina Hamlin and Anne Heaton), in what is at once a celebration of musical community and a compelling invitation into Zukerman’s world. Like Zukerman herself, the music is alluring and impossible to resist – and why would you want to?